Since ERP systems facilitate information flow between different core business functions there are usually decision-makers within all parts of a company that utilize it. The information output of a successful ERP system allows a company to easily identify areas of success and potential problems in its current business model from start to finish. 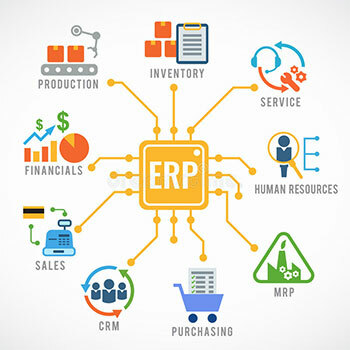 Below are some top ERP Software products for businesses. NetSuite allows businesses to continue focusing on what they do best and to react to new market opportunities swiftly and confidently. From advanced financials to supply chain management to billing and beyond, NetSuite ERP gives companies the tools they need to accelerate growth and drive innovation. Increase control over your small business with software designed to grow with you. Make your key processes more efficient, gain greater insight into your business, and make decisions based on real-time information – so you can drive profitable growth. Run and maintain your ERP software affordably, handle all your department needs with one solution, and power your business growth with keen insight. Oracle JD Edwards service is an integrated applications suite of comprehensive enterprise resource planning software that combines business value, standards-based technology, and deep industry experience into a business solution with a low total cost of ownership. Only JD Edwards EnterpriseOne offers more choice of databases, operating systems, and hardware so you can build your IT solutions to meet your business requirements. Sage Intacct helps CFO's access integrated management and financial reports across their business entities—in minutes—to grow and drive their business. Sage Intacct is the AICPA preferred Financial Management Solution that allows your growing mid-sized business to go further and faster with the core financials. With Odoo, manage all of your business processes in a modern, modular and integrated ERP software solution. Odoo is an all-in-one business software including CRM, website/e-commerce, billing, accounting, manufacturing, warehouse. Inventory and project management. Deltek provides solutions designed to successfully align your two biggest assets — your people and your projects — throughout all areas of your business.